Come and enjoy some great Irish Dancing at the Hawth. It seems like an eternity ago that Ireland last won the Eurovision Song Contest, but born there was the global phenomenon of Riverdance. You too can enjoy Irish dancing at the Crawley Irish Festival with displays throughout the afternoon. 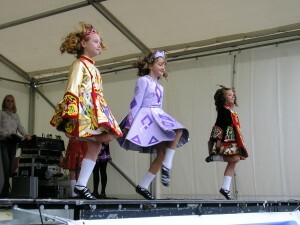 Irish dance displays form an integral part of the Crawley Irish Festival and continue to prove more and more popular each year. Local and regional dance schools demonstrate their routines in the August bank holiday sunshine and entertain the crowds. Crawley is the proud home of several wonderful Irish Dancing Schools. The Studio gives us all an opportunity to get involved with traditional style set dancing. Live music using traditional instruments will help with the mood while you can dance along with complete strangers and quite a few spectators! Sponsorship is available which includes stage branding, inclusion of logos on publicity material and on the website. For more information, please contact John Nolan on 07956317492.